One little band can give quite a workout! I got a question today from Maggie about whether resistance bands will really build bone. Good question, Maggie! Muscle strengthening exercises exert a pull on bones, no matter what method is used, weights, bands, exercise machines, or body weight. Muscles are attached to our skeleton by tendons. When you work muscles a little harder than usual, the muscles and their tendons exert a harder pull on the adjacent bones, stimulating them to slow down bone loss. Strength training and bone density research usually have been done using machines because of the ease in controlling the variables, but research has been done with muscle strength and resistance bands. Resistance bands show gains in muscle strength comparable to weights. In their book, Strength Band Training, physical therapists Phil Page and Todd Ellenbecker state, “Research demonstrates that ERT (elastic resistance training) provides as much benefit in strength gains as the use of more expensive and bulky weight-training equipment. A 2008 study by Colado & Triplett compared 10 weeks of elastic- and machine-based exercise at the same intensities…The elastic- and machine-based groups significantly increased their strength and muscle mass…” “In fact, strength training of the legs with elastic resistance can even help improve your balance, gait, and mobility.” Improvement in your agility and balance are so important for staying on your feet and another reason why bands are great for bones! Since most fractures occur from a fall, if we’re more agile and balanced, we’ll have less chance of a fall and a fracture. Author Kerri Winters-Stone, PhD is an exercise physiologist and researcher who has developed exercise programs to improve bone health and reduce the risk of fractures. NASA , one of her grant sponsors, is very concerned with the bone health of its astronauts because of the rapid loss of bone during space travel. 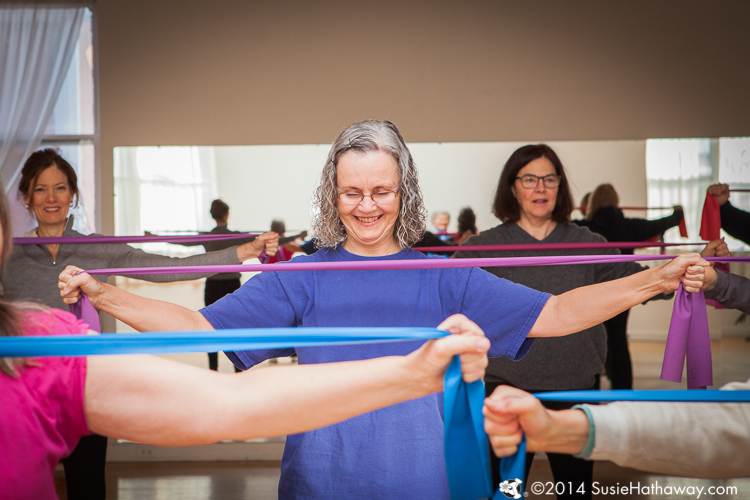 In Dr. Winters-Stones’ book, Action Plan for Osteoporosis, resistance bands are used in many of the upper body exercises. Weight bearing exercise is one of the two types of exercises known from university research to help bone strength. Often, we hear that we must do weight bearing exercise to help our bones. This conjures up images of bearing weights, but weight bearing exercise is simply any exercise done on your feet like brisk walking, climbing stairs, or any sport done upright and on your feet. These leg bands are very effective! The second type of exercise known to help bones is muscle strengthening exercise (also called strength, resistance, or weight training) and is any movement that creates a small, gradual overload reaction on the muscles and bones. It can be done with dumbbells, ankle weights, body weight, machines, or pulling on something like resistance bands. All of these means will produce the end result of stronger muscles which then pull harder on the bones during exercise. That harder pull is what stimulates our skeleton to build bone in our bone-building years and slow down or halt bone loss after thirty. Piecing together the puzzle of what exactly can help our bones from developing osteoporosis is a work in progress. Scientists around the world are working on it. Results show that study participants can often slow down or halt bone loss, with gains of around 1% in the post-menopausal years in just 2 strength or resistance training workouts per week. Those in the control groups that didn’t exercise continued to lose bone density and balance at varying rates. Younger people can build bone up until age 30. After 30, it’s a matter of keeping that peak bone mass as long as possible. Bone loss is the most rapid in a woman’s life during the few years before and after menopause. Those short two hours a week of strength or resistance training can make all the difference in slowing bone loss and preventing osteoporosis. Have a question or comments about using resistance bands? Enter a comment below! 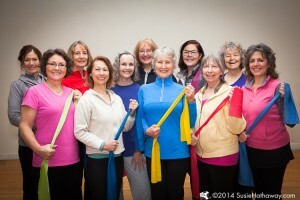 ← Resistance Band Training for Osteoporosis Prevention DVD Released! gym motivated. Which of your DVDs would you suggest me to purchase so that I may have a 15-30 minute workout per day, possibly split up. Thank You. The good news with strength training is that you only need to do the workouts 2, maybe 3 times a week at the most. Which DVD to pick would really depend on your personal preference for free weights or resistance bands. Also, the exercises in each DVD are grouped differently. 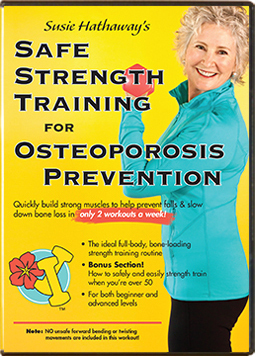 The Safe Strength Training for Osteoporosis Prevention DVD is 50 minutes long and is structured so that one set of muscles is working while you’re resting another. It alternates between legs, arms, back, and abdominal exercises. About half of the exercises are done standing and half are on a mat on the floor. Exercises are done using dumbbells, ankle weights, and one’s own body weight. If you’d like to do shorter workouts, each exercise has its own section so that you can use your remote to advance through the video and easily pick out all of the legs one day, arms the next, and core (back and abs) on the third day. It’s important not to simply do the first 15 minutes the first day, the 2nd 15 minutes the second, and so on or it will turn it into an ineffective “toning” routine. It’s important to fatigue the group of muscles that you’re working that day so that they rebuild themselves stronger. 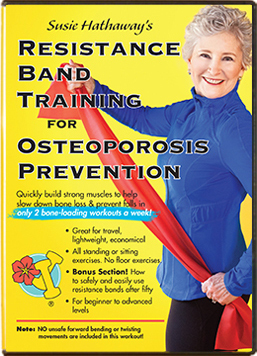 The Resistance Band Training for Osteoporosis Prevention DVD is 48 minutes long and is grouped in 3 different sections: Legs and back together, arms, and abs. For a shorter daily resistance band workout, you can simply pick one of the sections. 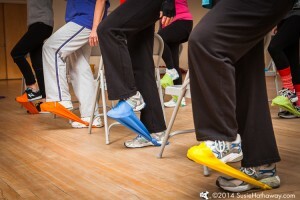 The majority of the exercises are done standing, with 2 in a chair. Equipment required: 2 resistance bands. With those shorter workouts, you could have a day of rest from strength training on Day 4 and begin the cycle over again. For both DVDs, however, it’s important to always do the 5-minute warm-up. I hope this helps you pick the DVD that will meet your needs. After doing a workout for a number of months, however, it’s very important to add variation to your exercises. Your muscles and bones need new and varied stimulus to stay in good shape. That’s why I have several different workouts that I do with my classes, 2 of which are now on DVD. I have a question about your dvd, Resistance Band Training for Osteoporosis Prevention. I like the concept of using resistance bands instead of weights, but the title of the dvd says it’s for prevention. What if a person already has full blown osteoporosis? Also, are spine and hip areas targeted? Thanks for any info. Thank you for your question! In my videos, there are numerous exercises that target the spine and hip. For the safety of those who already have osteoporosis, I only included moves that keep the spine in a neutral position, which is considered the optimal posture with osteoporosis. 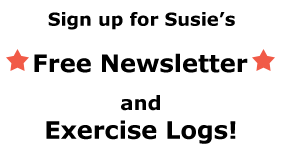 There are no unsafe moves in my videos for those with bone loss, such as bending forward from the waist which rounds the back, deep side bends, or twisting to the point of strain. I give safety cues throughout the workouts. I recommend that everyone see their doctor or healthcare provider before beginning this or any other exercise program. When you were diagnosed with osteoporosis, did your doctor refer you to a physical therapist (PT) knowledgeable about bone loss? If not, I encourage you to get a (PT) referral so that you can get specific, individualized guidance on moving safely with osteoporosis. In my DVD introductions, I go over safety precautions. All of those leg exercises target the hip muscles and bones. The arm exercises and standing back extensions target the back while they’re also working the arms, shoulders, and chest. More than half of the women who come to my classes have osteoporosis or osteopenia, but they all received their doctor’s okay to participate in the class and have also been given instructions on any weight limits with the dumbbells and ankle weights. You might look through the Amazon reviews to see if you feel the DVD would be right for you. Please let me know if you have further questions. Thanks! I have arthritis in my hands. Can you tell me if one or the other DVD is easier on hands? I also see that you alternate workouts, is this essential? With arthritis in your hands, you might need to use wrist weights in place of dumbbells. In that case, the Safe Strength Training for Osteoporosis Prevention DVD would be best. With the Resistance Band Training for O.P. DVD, you’d need to hold the band with your hands, but maybe you could adapt a band by tying loops in the ends and slipping them around your wrists to keep it easier on your hands. Either DVD would be fine for your legs, back, and core. It’s always a good idea to mix up your workouts to keep your bones “on their toes” so to speak. Bones can get complacent and not respond as well if you always do the same workout. Is using a rowing machine considered a weight bearing exercise? Weight bearing exercise is any movement done on your feet—bearing your weight on your feet where gravity has the most effect. A rowing machine is fantastic aerobic exercise, but it’s not weight bearing. If it’s a favorite of yours, be sure to also get in some on-your-feet exercise time. If you have bone loss, it’s vital to not to round your back in a forward flexion. The front part of our vertebrae have around ¼ the strength of the back part, which is why vertebrae often collapse in the front with osteoporosis. Great care would need to be taken to keep a neutral spine with a rowing machine or any exercise machine that has reciprocal arm movements, like elliptical trainers or stationary bicycles. Several acquaintances have had very good bone density tests after going to Osteostrong workouts for a year or more ; how do the more traditional/ conventional weight bearing and resistance regimens compare ? Most of what I see recommended is from 2015 or before , but in 2017 there seems to be some serious disagreement about older methods being useful , except of course for muscle building and maintenance which are obviously important . Any current comparative studies would be appreciated . I haven’t seen any large, controlled trials comparing traditional resistance/strength training to the Osteostrong/Biodensity program, at least on PubMed, which is where they would be published. I think the advantage of the Osteostrong program is that it’s a type of resistance training that is brief and supervised and progresses people to a high level of intensity that they might not otherwise do on their own. I feel that a good, moderately-high to high-intensity resistance/strength training program is just as beneficial. Getting people to safely work up to that level is the challenge. In my classes, with each and every exercise, I guide participants to go to the level of fatigue, with good form—the key to staying safe. If people gradually build up to working hard, but not straining, they can get results. But just like strength training, Osteostrong participants still need to be careful, following instructions exactly because there have been some vertebral fractures—two that I’ve seen reported on the National Osteoporosis Foundation’s online Support Community. I wouldn’t dismiss traditional resistance training because, since 1994, university research has repeatedly shown it to be helpful for bones at schools like Tufts, U. of Florida, U. of AZ, and Oregon State U.
Agility, balance, and coordination also come into play with traditional resistance training. The cost of Osteostrong can be prohibitive, but strength/resistance training is very low cost. One or two months of the Osteostrong program would pay for a lifetime investment in one’s dumbbells and leg weights. Resistance bands would cost less than one session. If cost were not an issue and an Osteostrong machine was in my neighborhood, I’d give it a try, but only in addition to doing high-intensity strength training twice a week and 30-45 minutes of weight bearing cardio on most days of the week. Again, it’s going to take some time for research to be done to see if gains with Osteostrong actually reduce fracture rates and have a large, sustained increase in BMD. Susie, what do you recommend for weight bearing cardio most days of the week? I have both your DVD’s. Is it OK to do one DVD two days a week and the other DVD two days a week? You’ll get the best results by doing strength training every other day or every third day if you’re working very hard where you can barely do the last repetition of a set in good form. The goal is to work your muscles so that they’re fatigued enough that they have to rebuild themselves stronger. This take a day or two. In the meantime, brisk walking is the most convenient for weight bearing cardio. Or any aerobic exercise done on your feet like dancing, an elliptical trainer, treadmill, stepping machine or steps, or an aerobic video would all be beneficial for your muscles and bones. Cindy, since your fractures occurred from only walking, it would be best for you to get guidance from your healthcare provider and a physical therapist who works with those with bone loss. One-on-one guidance by those who know your medical background is crucial for you to avoid further fractures. I have had 2 prolia shots and am now experiencing intermittent extreme pain in my right hip (I have bone spurs, also in that hip.) I also have developed TMJ. I fear that the shots have promoted these issues and am seriously considering stopping them. I have osteopenia and cannot seem to take anything related to osteoporosis meds. If I quit taking them, will doing the arm band exercises or other weight bearing exercise help? I have started walking again after about a 6 month reprieve. Thank you for your help. Resistance/strength training exercise, as well as weight-bearing cardio, like brisk walking, are both recommended by the National Osteoporosis Foundation for bone health. Both types of exercise help slow down or halt bone loss, with research showing a 1% gain in those who do strength training. Those who don’t strength train can lose bone density at a much faster rate. There are always differences in one’s individual response to exercise. I hope that you can work with your healthcare provider for guidance on your medications. Thank you for your nice response, Dr. Robinson!